Roadside bomb hits Egyptian Police convoy, as operation to root-out Islamist radicals continues. 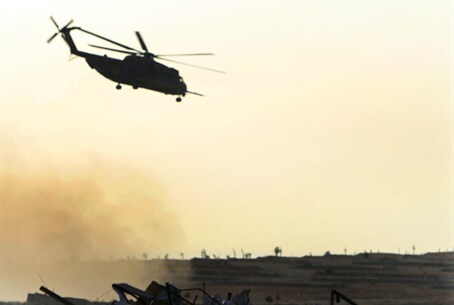 Nine Egyptian soldiers were wounded today when a roadside bomb struck a convoy they were travelling in Egypt's restive Sinai Peninsula. Security officials blamed "Islamist militants" for the attack, which comes as Egypt's military continues an operation to wrest control of the region from Islamist groups, which moved in to fill the the power vacuum which ensued following the ouster of former Egyptian president Hosni Mubarak. After the overthrow of his Islamst successor, Mohammed Morsi, Islamist terrorists upped their campaign against both the military and anyone else suspected of sympathizing with the military-backed transitional government - in particular the country's Coptic Christian community. The bomb exploded on outside the town of Rafah, on the border with the Gaza Strip, and is likely to further strain relations between the new Egyptian administration and Gaza's Hamas rulers. Hamas is an offshoot of Mohammed Morsi's Muslim Brotherhood, and the interim government, which opposes the Brotherhood, has long accused Hamas of helping armed groups destabilize Egypt. Hamas has repeatedly denied the accusations, labeling them as "lies and fabrications."